If you are a regular computer user, then I’m sure in your computer have a lot of folders. If you are going to open those folders, sometimes you may get confused because all folders are in the same color folder. So, in this post I’m going to introduce top 2 free software to add color to your folders. We may have a lot of folders in our computer, but we use some folders daily to access files. 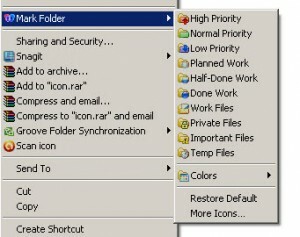 To make easier to identify those folders we can use some software to “color folder” or changing the way of look of that folder using small utility. 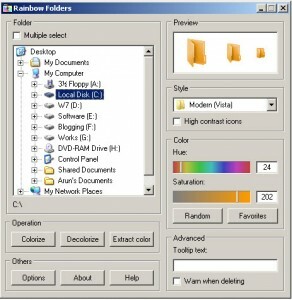 Rainbow Folders in one of the software/utility used to change the color of the folder. The main use of this software is we can change the default color of folder to any color as you like by using color option, which is provided in the utility itself. And the color what you are going to change is displayed in the Preview option, so you get any idea of how my folder going to look after applying color. A beautiful software to color folder and change the folder type. I personally prefer this software to use, because it is having a lot of feature compared to all other folder color software and best of it is freeware. MyFolder software is having more and more good feature and it is really easy to use this software. Are you presently using any of these software? If yes, what you feel about these software and If you know any other software to color folders let us know those software through your comments. Have downloaded the software 🙂 will use it . Thanks . I really like to download rainbow coloured folder, its so beautiful to me.